Digger has a happy disposition and is developing into a solid boy with perfect bite, great movement, level topline, dark eye, excellent pigment and a strong headpiece. Digger is now proven at stud having sired two litters. First litter of ten puppies(eight surviving) and second litter of seven puppies(five surviving). 2nd Baby Puppy dog, 2011 Royal Melbourne Show. 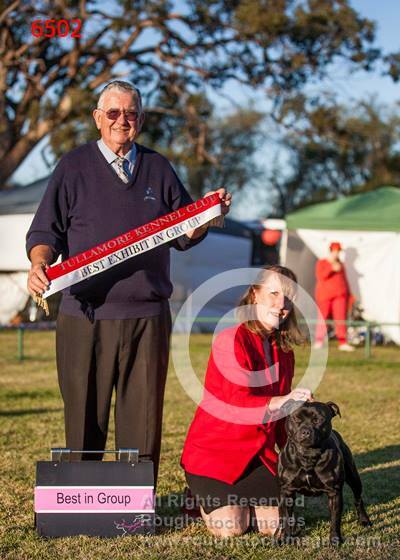 .Minor Puppy in Group at 2012 Lancefield Kennel Club, judge Miss Jill McDonald. Reserve Dog and Runner up Best of Breed at the 2012 Sunbury Kennel Club championship Show under Mr C Qinones (Columbia) 42 Stafffords entered. YOU'VE DONE IT AGAIN! THANKS FINNY FOR SHOWING THE BOY. IN JUST FIVE SHOWS WITH LIMITED SHOWING DIGGER HAS DONE US PROUD. "Truharts TRUHART TRUE GRIT. B,Brindle good head with neat ears, nice front and good rib for age." "Dk Br. Topsize. Nice head shape and body properties. Showed well. Promising." 21 months old. Top size black/brindle – well balanced, excellent muscle definition, good tail set, decent bend of stifle and straight front (although a slightly cleaner shoulder line would improve front profile). Excellent head shape, housing perfect bite and dark enough eyes. Moved out with drive and purpose. Multiple best in Group and Class in Group winner. 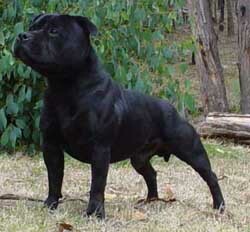 Buckley is retired from the show ring and stud. He is now one of the couch potatoes after some great achievements in his show career.